Naturalist, researcher, author and businessman Jack Rudloe of Panacea believes that when food is taken from the sea, food should be placed back into the sea. And Rudloe, who is president of the Gulf Specimen Marine Lab, views the countless trees that were felled by Hurricane Michael as “seafood,” that is, food that can replenish coastal waters. “The so-called debris and the sea grasses and trees and all that stuff should be dumped out into the ocean to replenish everything, but instead we spend millions and millions of dollars hauling it to landfills where it is just going to rot,” Rudloe said. Hurricanes, then, can invigorate bays and estuaries in the same ironic way that forest fires are good for forests. Storms, said Rudloe, have the immediate effect of stirring up the “goop” and the detritus on marsh bottoms and, in such a way, disbursing vitamins and nutrients that promote plankton blooms. Food chains are recharged and, before long, shrimp populations boom. It’s what Rudloe and others have called the Bubba Gump Phenomenon. In The Living Dock, Rudloe cited a study by Dr. Philip Butler at Gulf Breeze Laboratories that demonstrated that waters are much more productive after a storm. 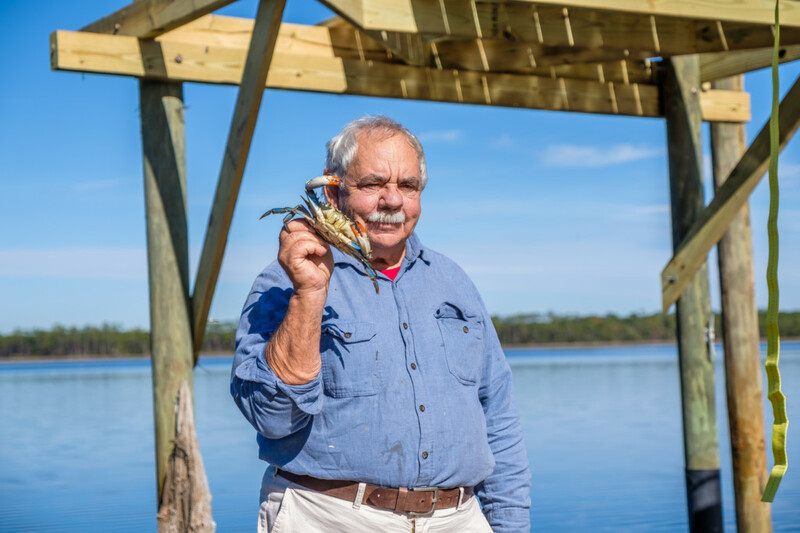 Rudloe’s dock at Panacea, which he built back after Hurricane Michael mangled it, has been through nine hurricanes and tropical storms and has come and gone several times. “We are stealing food from the ocean,” Rudloe emphasized. “You could easily put trees on barges and disperse them up and down the coast in appropriate areas. We think of nutrients as negative, and the sewage and the pollution we introduce to the water are bad, but nutrients supplied by nature are part of a healthy process that increases productivity and fisheries — and fisheries equal money. Rudloe is frustrated that public policies impede rather than encourage feeding our estuaries. He is irritated that, in the United States, we discard rather than employ natural substances of value. China extracts chitin from shrimp shells to make bandages that promote healing of wounds in an extraordinarily short length of time. So, it may be that in time we become less civilized or more civilized, depending on how you look at it, and learn to throw trees in the sea.